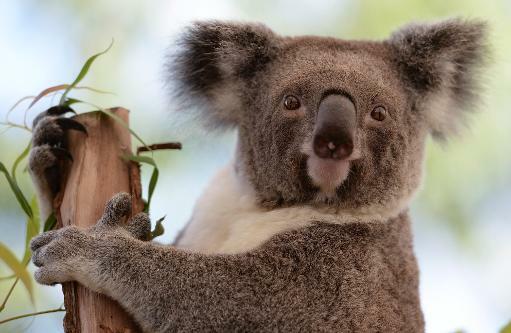 Sydney (AFP) – Australia’s native koala could face a wipeout from increasing temperatures unless “urgent” action is taken to plant trees for shelter as well as eucalypts to eat, a study found Thursday. Lead researcher Mathew Crowther from the University of Sydney said the three-year study tracked 40 koalas by satellite in north-western New South Wales to examine their nesting and feeding habits. It was the first research to compare where the tree-dwelling marsupials spent their days against their nights and found that large, mature trees with dense leaves were critical to their survival, particularly during extreme weather events like bushfires and heatwaves. “Our research confirmed koalas shelter during the day in different types of trees to the eucalypts they feed on at night,” said Crowther. Unlike their very selective feeding sites — koalas eat the leaves of a narrow range of eucalyptus species — Crowther said the study found the animals would shelter in a relatively wide variety of trees, underscoring the impact of land-clearing on their vulnerability as Australia’s temperatures hit new records. Crowther said one-quarter of the study group was wiped out by a 2009 heatwave that preceded Australia’s Black Saturday bushfires, an alarming statistic “given the increasing frequency of extreme weather events”. “Ensuring a habitat has a good supply of feed trees and protecting koalas from predators is not enough to ensure their survival,” he said. According to the non-profit Climate Council think tank, this September was the hottest ever recorded in Australia, with national average temperatures 2.75 degrees higher than the long-term average. In a report published Thursday on the latest Bureau of Meteorology data, the council said 2013 was on track to become Australia’s hottest year on record, surpassing the previous mark set in 2005. A government inquiry into the fate of koalas which handed down its findings in 2011 warned that the sleepy, furry creatures were under increasing threat and should be considered a vulnerable species, with habitat loss seeing their numbers plunge. Thought to number in excess of 10 million before British settlers arrived in 1788, there are now believed to be as few as 43,000 left in the wild, though their existence high in the treetops makes them difficult to count.